I am a Certified Travel Consultant (CTC) and Accredited Cruise Counsellor (ACC) and have attained specialist status with several ocean and river cruise lines. I am passionate about travel and my personalized service and travel expertise will provide you with many insights that you normally might not consider when thinking about your next dream vacation. My personal travels are especially helpful in providing guidance to clients that are looking for a memorable experience but are overwhelmed with the number of countries and variety of options to choose from. My recent trips to Asia, South America, Jordan, Caribbean, Mexico & Europe are just a sample of the destinations I have visited. I am looking forward to my upcoming trip to the Galapagos islands as many of my clients have identified that on their bucket list. Let me work with you in planning your next trip and I am confident that it will end up being one of your best. This is one of my most memorable trips as it brought us back in time and made you appreciate the architecture of early civilization and the culture of this Middle Eastern country. The Jordanian people were welcoming, and the country was amazing. Day 1 - The trip started with an afternoon flight from Calgary to Chicago followed by an overnight flight with non-stop service to Queen Alia International Airport (QAIA) Amman, Jordan. Day 2 – Arrived in Amman and we were quickly transferred to the beautiful Four Seasons Hotel in Amman where we were able to relax and prepare for the upcoming week discovering this great country. Amman, the capital of Jordan, is a fascinating city of contrasts ideally situated on a hilly area between the desert and the fertile Jordan Valley, a perfect base to delve deep into Jordan as it is no more than a four-hour drive from anywhere in the country. We visited the ancient city of “Jerash, the Crossroads of Civilization”, remarkable for its unbroken chain of human occupation. The city’s golden age came under Roman rule and the site is now generally acknowledged to be one of the best preserved Roman provincial towns outside of Rome in the world. There were remains from the Neolithic times, as well as Greek, Roman, Byzantine, and Omayyad civilizations dating back as far as 135 AD. Our day started with a tour of the Amman Citadel. The Hill of the Citadel in the middle of Amman was occupied as early as the Neolithic period, and fortified during the Bronze Age (1800 BC). The ruins on the hill today are Roman through early Islamic. We then drove towards the wilderness on the eastern banks of the River Jordan known as Bethany-beyond-the-Jordan. According to the Bible, it was here that the prophet Elijah ascended to heaven on a chariot of fire, and where John the Baptist came centuries later preaching and baptizing in the spirit of Elijah. Here Jesus came to be baptized by his cousin before beginning his public ministry. The next stop was Mount Nebo, where Moses viewed the Holy Land and is said to be buried. A beautiful basilica church with one of the most magnificent mosaic floors in the world is present. From the platform in front of the church, we had an inspiring, breath-taking view across the Jordan Valley and the Dead Sea to the rooftops of Jerusalem and Bethlehem. The last stop was Madaba, “The City of Mosaics”. Here we visited a mosaic factory and the Greek Orthodox Church of St. George that featured a vivid sixth-century Byzantine mosaic map showing Jerusalem and other holy sites. Day 4 – Started the day with a 3-hour drive to Petra, one of the new Seven Wonders of the World, a UNESCO World Heritage Site, and Jordan’s most valuable treasure. 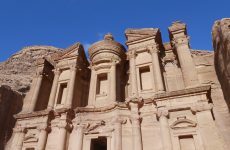 Petra is Jordan’s greatest tourist attraction and was one of the highlights of my trip. Jordan abounds in archeological riches, but few sites in the world can rival the Nabataean city of Petra, carved out of the rose-red rock cliffs! The day ended with a drive to the resort city of Aqaba located on the Red Sea where we stayed at the beautiful Kempinski Hotel Aqaba. A morning jeep tour in the spectacularly scenic desert valley. Wadi Rum is where Lawrence of Arabia operated throughout 1917 in this extraordinary desert landscape. “Vast, echoing and God-Like” is the way Lawrence described Wadi Rum, the largest and most magnificent of Jordan’s desert landscapes. Most recently, “The Martian” starring Matt Damon was the location where this popular Hollywood movie was filmed. Day 6 & 7 – Spent the last 2 days of the trip at the Kempinski Hotel Ishtar Dead Sea. An amazing 5-star property located adjacent to the Dead sea which is the lowest point on Earth. As unbelievable as it may seem, your body naturally floats in the Dead Sea because you just cannot sink! Considered to be the largest natural spa on earth and well-­known healing powers of minerals from the from the sea’s muddy floor. We entertained the local tradition of applying mud to our bodies and soaking in the sea. The feeling as you exit the water is amazing as your skin feels silky smooth! The trip started with an overnight flight from Calgary to Toronto with a connection to La Guardia airport in New York City. Stayed at the Renaissance hotel n the heart of Times Square. Never a dull moment in the Big Apple and as always, a great place to visit. Transferred to the Cape Liberty Cruise ship terminal in Bayonne, New Jersey the following morning. Cruise Day 1 & day 2 - Relaxing sea days and an opportunity to take partake in the amenities & activities on the Celebrity Summit cruise ship. Day 3 - Arrived in the beautiful island of Bermuda. Took a 40-minute ferry ride from King’s Wharf to the historic town of St. George, a UNESCO World Heritage site. A guided walking tour provided insights and stories about the history of St. George, where Bermuda began over 400 years ago. They played an integral part in the colonization of the “New World”. Visited several historical buildings followed by a horse and buggy ride around the town including a stop at the Gates Fort Park. Also viewed the re-enactment of the “dunking of the wench” which is a popular tourist event. Day 4 - Spent the day at Horseshoe Bay Beach rated #8 best beach in the world by Trip Advisor. Beautiful soft pinkish sand beach with a clear turquoise ocean made for an enjoyable day. Should have put on more sunscreen! Day 5 - Glass bottom boat ride that brought us to see a shipwreck, coral reefs filled with fish and plant life as well as spotted some large green sea turtles. Walked around King Wharf’s and visited the various shops. 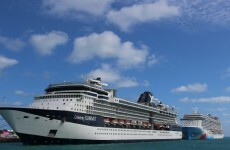 Day 6 – Another relaxing sea day on the beautiful Celebrity Summit. Day 7 - Arrived at the Cape Liberty Cruise ship terminal and transferred to La Guardia airport for my return trip to Canada. Would I return to Bermuda? Definitely….. Bermuda is now one of my favorite islands! Highlights from my March 2016 trip around South America. Visited parts of Chile, Argentina, Falkland Islands and Uruguay. - 3 days in Santiago - Fantastic, walkable city where the locals spend their evenings socializing and exercising in the city parks. 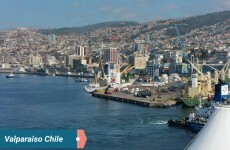 - Bus ride to Valparaiso where we toured this scenic city of cerros (hills) with a ride up the teleferic (think outdoor slanted elevator) to the hilltop to see multi-colored homes, street art and terrific bay views. - Enjoyed my balcony stateroom with gorgeous views of the Andes mountains, fjords (glacier formed channels), glaciers, Cape Horn (windy) and wildlife. - Hot, humid in Santiago. Further south snowed a bit, rained a bit, windy at times, though fortunately was fantastic mild weather. How to dress? It's all about layers. - We rented a car to drive around the lake district of Puerto Montt which included 1 hour of fantastic zip lining. Sun came out for the Volcano Osorno and Petrohue waterfall. - Had a great private tour of Punta Arenas, which included a visit of the iconic Plaza Munoz Gamero, where locals and travelers gather to kiss the feet of the statue of Magellan in hopes of changing their fortune. This was followed by a tour of the Magallanes Regional Museum and the Punta Arenas Municipal Cemetery where the burial plots of influential colonizers can be viewed. - Enjoyed Ushuaia, Argentina famed as the 'City at the end of the World' and taxi ride around Tierra del Fuego national park and the end of the Pan-American highway that goes all the way to Alaska. - Sailed through Beagle Channel and past the treacherous Cape Horn. Enjoyed the whale sightings, sea lions, seals, dolphins and frequent bird sightings. Binoculars were very handy. - Falkland Islands with its British ties (although Argentina still claims it on their maps). 4-wheel adventure ride out to Bertha’s Beach/Gypsy Cove for an unbelievable penguin encounter with hundreds of Penguins including the King, Gentoo, Magellanic and Rockhopper species. - Strolled through the streets of Puerto Madryn where we took in the local sites. - Disembarked the ship for two days in Buenos Aires. Nice tour of the highlights including the Recoleta Cemetary with ornate mausoleums, Catholic cathedral where Francis resided before becoming Pope, Evita landmarks, La Boca bohemian neighborhood, Sunday market and lots of tango dancing. - Met a lot of super people, attempted to speak Spanish, and enjoyed wonderful cuisine and wine. - My trip ended with a 2 night stay in Puerto Iguaza where we toured the town on the first day and visited Iguaza Falls on Day 2. This was definitely the highlight of my trip. The first Alaskan cruise of the 2014 season on the Carnival Miracle left Vancouver on April 28th and ended on May 6th in Seattle, WA. 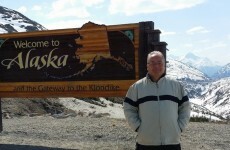 Port of call stops included Juneau, Skagway & Ketchikan and cruising in Glacier Bay and through the inside passage . Not only was the scenery breathtaking but the temperature was above average with sunny skies at each of our stops. We saw whales, porpoises, sea lions, bears and lots of bald eagles along with a variety of other wildlife species. Expecting some cold temperatures in late April, we were amazingly surprised to get up to 74 degree F temperatures at some of our stops while the temperature was hovering around the freezing point in Calgary during the same period. The cruise was not only relaxing but also provided an opportunity to admire this scenic destination. 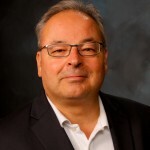 Paul Dumouchel is an independent owner, affiliated with TPI.